Today is the launch of Watershed’s online advent-style calendar Electric December. Though I’ve only been involved in ED indirectly this year I’ve had various connections with the project for a long time so thought I’d add a post about this now fondly anticipated feature of Bristol’s cultural landscape! This is its 13th consecutive year and it’s evolved and reinvented itself many times since its first appearance in 1999 and has managed to maintain a fresh and appealing quality through ongoing discussions, responding to feedback, developing new audiences and collaborations – processes for which Watershed has great aptitude. The current ED format is an online young people’s short film festival, drawing in work from local, national and European sources, but when it began it was to provide a showcase for what Bristol’s creative industries could do with this marvellous new technology called Broadband! If you go to the ED archive you’ll be able to view films from well known names in Bristol’s creative sector like Aardman, Bolex Brothers, Arnolfini, Spike Island, BDH, Nameless, Knowle West Media Centre and BBC to mention a few. Once Broadband became the norm rather than a novelty technology the emphasis on ED’s participants began to change; while some schools and community groups had been involved from early on, the collaborations between these organisations and creative media companies or individual practitioners became the means of producing creative outcomes to populate the windows of the calendar. This is the point, in 2003, where I joined ED in a freelance capacity (having helped friends and family and done some unofficial brokering between artists and groups to create windows on earlier ED projects), working to persuade Bristol’s creative community to give their time to work with schools or groups who had ideas but insufficient technological skills to realise them fully – hence some intriguing marriages that created diverse ‘presents’ in the ED calendar windows between 2003 and 2006. 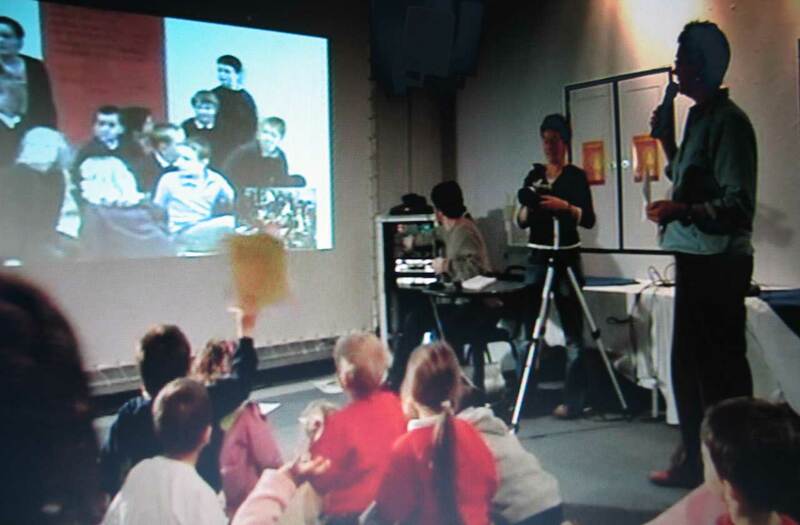 First live link for Electric December in 2003 between some schools at Watershed and children in Cornwall for the launch event. Understandably it became more difficult for companies and freelancers to donate time freely and by 2006 there was a lot more creative content being produced by people – particularly young people – that was appearing on You Tube, created on their own computers in their bedrooms; a new approach was needed to sustain ED’s presence and growing worldwide audience. In 2007 Watershed changed direction with ED07, turning it into a showcase for ready made short films made by young people for the first time. I wasn’t involved that year as it was produced in-house with the young Watershed team, E-Shed. It was a great success and when I became an employee at Watershed the following year, I was once again involved in ED, working with the E-Shed team to recruit films from Bristol, UK and Europe for ED08. Teams of young people from Lithuania and other EU countries helped select the entries and prizewinners – top prize was travel and full pass to BUFF, young people’s film festival in Malmo, Sweden. Just before ED08 went live I chaperoned Sam, an E-shed member, to an event called Borders at the Cinémas du Palais, (another Europa Cinemas member like Watershed) in Créteil on the outskirts of Paris. We’d been invited to present Electric December to the participants at this intriguing gathering of young people from film-making organisations from all over Europe. It was an intense and fascinating few days – making films in an hour, taking part in discussions about how film can change the world and visiting local schools to show a short but moving film made in Bosnia earlier that year at a summer camp attended by many of the young people who we were with in Paris. Some of these young filmmakers had also created a film that was included in ED08 on day 13. Electric December was seen by the Borders project as a great model for engaging young people as participants and giving them a voice – the 2007 Paris riots had generated an urgent need for such initiatives. Here are a few (very poor taken on an old mobile!) shots from the visit. Back to this year – my marginal connection with this year’s calendar is through days 8 and 21 – Counterpunch and Tick Tock – films made for the Short Cuts project I worked on last year as part of RELAYS at Watershed – good work teams, but there’s lots of other great work in there too, so congratulations to everyone else involved in this year’s Electric December – I know how hard you’ve worked! This entry was posted in Work and tagged Bristol, short films, Watershed. Bookmark the permalink.